Most patients presenting with acute diarrhoea can be reassured that their condition is self-limiting, and management is focused on preventing dehydration. Patients can be advised to seek further treatment if their symptoms worsen or are persistent. Laboratory investigation is rarely indicated for the majority of patients with acute diarrhoea. In some patients, however, investigation will be necessary. This is indicated by the presence of risk-factors that increase the pre-test probability of a notifiable bacterial infection or that suggest the patient’s risk of complications is higher (Table 1). Testing usually follows a simple algorithm – faecal culture and microscopy is used as the “first-line” test, with further tests, such as Giardia and Cryptosporidium antigen tests or stains for ova and cysts, added if there is a risk of these pathogens being present. When a faecal stool test is necessary, usually only one stool sample should be sent for analysis. The same sample can be used for bacterial culture, microscopy and antigen tests. The less commonly used ova and cysts and Clostridium difficile tests can require up to three samples on separate days. Clinical information, including the indication for testing, should be included in the laboratory request, as some tests may be declined if an appropriate indication is not present. What sample should be collected? How many samples should be collected? 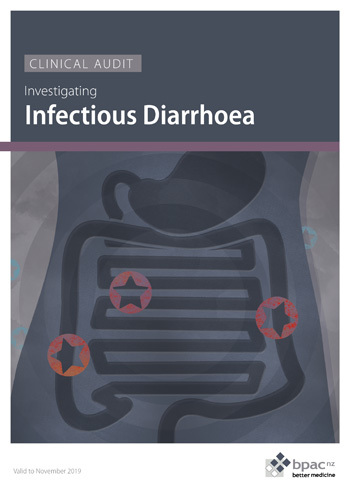 This audit focuses on the laboratory investigation of infectious diarrhoea in a patient of any age. Laboratory investigation should only be performed if the patient has risk-factors for atypical aetiology or an increased likelihood of complications. Patients who have had a faecal culture performed in the previous twelve months should be identified, then records assessed to check that that only one sample was taken, and that each test requested was indicated as per the laboratory test guidelines. Have an indication for each test clearly recorded in the patient’s notes or on the laboratory form. Any patient enrolled in the practice who has had a faecal culture requested in the previous twelve months is eligible for this audit. You will need to have a system in place that allows you to identify these eligible patients. Many practices will be able to identify patients by running a ‘query’ through their PMS system. Identify all patients who have a faecal culture and microscopy recorded from the previous twelve months. The number of eligible patients will vary according to your practice demographic. If you identify a large number of patients, take a random sample of 30 patients whose notes you will audit (or take the first 30 results returned). Use the data sheets provided to record your first and second audit cycle results. A positive result is any patient who has a “Yes” in columns A and B and a “No” in column C or a “Yes” in columns A, B, C and D. Record this as a tick in the “Positive result” column. Calculate your percentage achievement by adding up the number of positive results and dividing this number by the total number of patients audited.